It's April once again, which means its one of my favorite times of the year: National Poetry Month! Let's be honest: I'm far from an expert on poetry. I'm not super well versed in the form, and though sometimes I "get it," other times, I simply don't. That being said, I do find magic in poetry, even the poems that don't resonate as much as others. Whether a verse leaves you laughing or crying, scratching your head in confusion or marveling at the notion that someone else's words can capture the very essence of your being, poetry is an art form all its own that has a unique ability to set a child's imagination soaring. 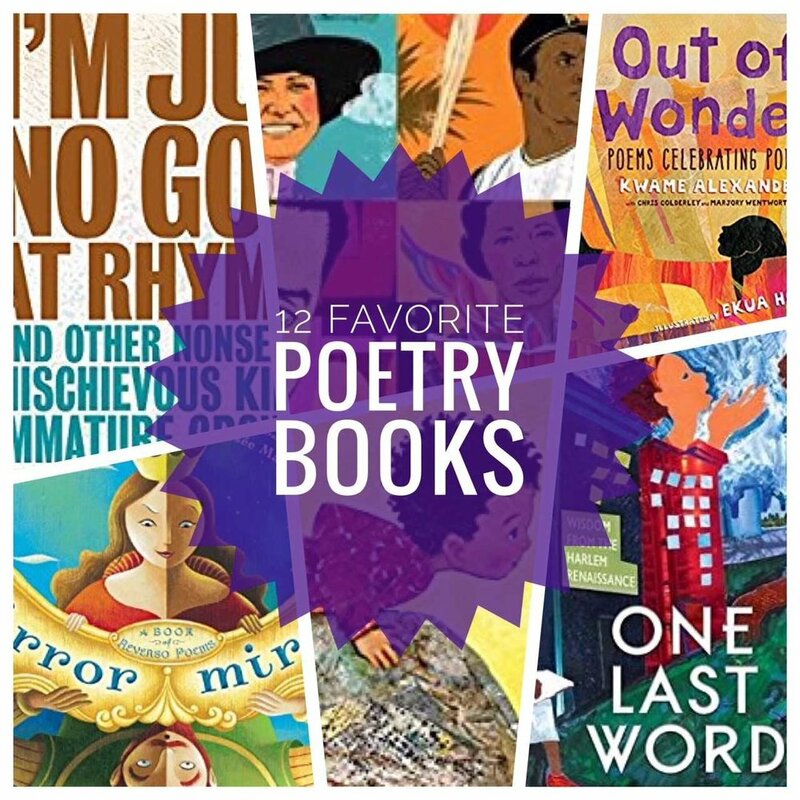 Here are some of our very favorite poetry books - the ones that make us giggle til our tummies hurt or delight us with their beautiful imagery. Happy reading! 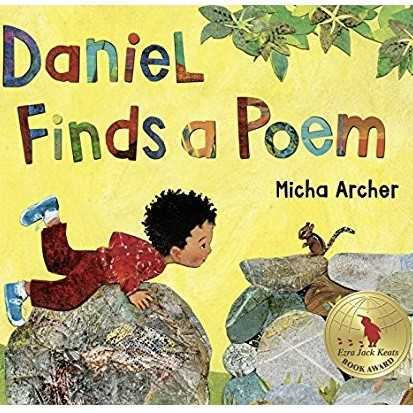 Daniel Finds a Poem, by Micha Archer: This has become the book I use to introduce National Poetry Month to my early elementary students, and every time I use it for a read aloud, it never fails to get a round of applause by each of my classes. This is a beautiful story for any child who asks you that all-important question "what is poetry?" Take your little ones on a walk through nature with Daniel and some animals, and delight in each animal's description of what poetry is to him. A forever fave! Wet Cement: A Mix of Concrete Poems, by Bob Raczka: Concrete, or shape poetry, is always a joy to introduce to my students. They ooh and ahh over the pictures, marveling at the way the words are arranged to take the form of familiar objects. This book is a favorite in our school, and we always use it as an introduction before drafting our own concrete poetry. 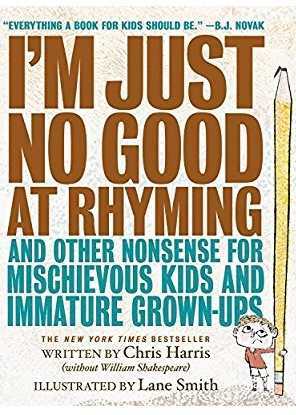 I'm Just no Good at Rhyming: And Other Nonsense for Mischievous Kids and Immature Grown-ups! by Chris Harris and illustrated by Lane Smith: If you like Shel Silverstein, this new poetry collection is an absolute must. We couldn't get through some of these poems without totally cracking up, and I was blown away by the wit, creativity, word play, oxymoron, and amazing interplay between the words and the illustrations. A uniquely genius collection that is equal parts novel and nonsense. Read Aloud Rhymes for the Very Young, by Jack Prelutsky and illustrated by Marc Brown: We read this book every night for months when my littlest was born, languishing in the lovely rhymes and delightful imagery. This is a wonderful anthology for your littlest readers; the poems are short, simple and sweet, making them perfect for tiny babes and toddlers. 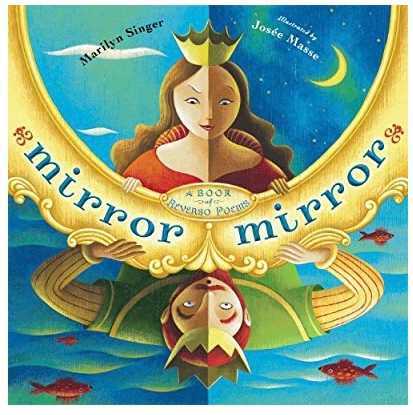 Mirror Mirror: A Book of Reverso Poems, by Marilyn Singer and Josee Masse: My students are absolutely enamored with these reverso poems, which can be read in the traditional manner (from beginning to end) and then in reverse. The poems work both ways, and some of them take on deliciously new meanings when read from bottom to top. Kids will pore over the magic in each poem, and they especially love how this particular book tackles fairy tales head on. When Green Becomes Tomatoes: Poems for all Seasons, by Julie Fogliano and illustrated by Julie Morstad: Everyone knows I adore this team, and this book simply sings. Beautiful poems spotlighting random days throughout the year convey the beauty of each season. Both starting and ending on March 20th, this is a perfect read to celebrate the wonder of each new season - and to help kids learn the seasons' unique characteristics, too. 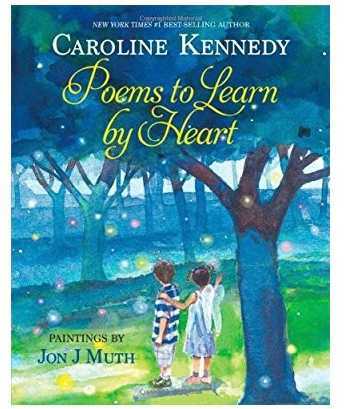 Poems to Learn by Heart, by Caroline Kennedy and illustrated by John Muth: This is a beautiful compilation of poems, both by modern and classic poets, that help kids and families celebrate the smallest to the most momentous of occasions. A stunning collection exploring emotions big and small, this is a perfect book for your library. Out of Wonder: Poems Celebrating Poets, by Kwame Alexander, Chris Colderley, and Marjory Wentworth and illustrated by Ekua Holmes: This is a gorgeous tribute to twenty famous poets that have inspired each of the three authors. The poems are all original pieces but pay homage to these revered poets, emulating their styles and voices. An original and ingenious gem! Where the Sidewalk Ends, by Shel Silverstein: This classic is a must for all bookshelves. It's highly imaginative and loads of fun, and the quirky poems will be ones your children will remember forever. Who else can recite all of the words to Sick? If you love Where the Sidewalk Ends, make sure to also check out A Light in the Attic, and Runny Babbit. Bravo! Poems About Amazing Hispanics, by Margarita Engle and illustrated by Rafael Lopez: This striking collection features both stunning illustrations and biographical poems about 18 famous Latinos, from baseball players to botanists to musicians. The poems celebrate their renowned historical contributions, as well as the impacts they continue to have on their vibrant and evolving community today. Hi, Koo! : A Year of Seasons, by Jon J. Muth: Featuring 26 haikus about the four seasons, the well known panda from Muth’s Zen series journeys through the year. This is a fresh take on the traditional Japanese haiku, inviting young readers to stretch their creative muscles as they explore the inviting natural illustrations and simple, yet pitch perfect, prose. One Last Word: Wisdom From the Harlem Renaissance, by Nikki Grimes: One Last Word pairs the voices of the Harlem Renaissance with Grime's unique words. Utilizing a method known as the the "Golden Shovel," Grimes' poems incorporate original stanzas from master poets into new and inventive pieces perfect for your upper elementary students. The result is astonishingly beautiful: poems that resonate deeply with the reader and touch upon issues that still plague society today - issues such as racial injustice, identity, and peer pressure.